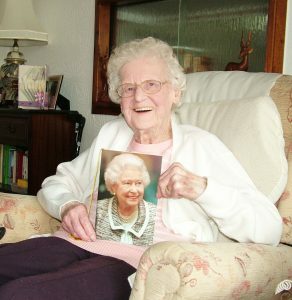 GOLDSWORTH Park’s May Cronin has celebrated her 100th birthday. May marked the start of her 101st year on 26 May with close family at her favourite Chinese restaurant. A second celebration followed at The Cricketers pub last Sunday with 30 members of the family including eight grandchildren and 11 great grandchildren. “I am very lucky to have my wonderful family around me – they’re the tops!” she said. May was born in Maybury Road, Woking, and has always lived in the town. She recalls life was hard growing up: “My early childhood was during the Great War and my father was in Egypt. My mother was stone deaf but by the grace of God she understood what I was saying. “In those days Woking was a lovely village with lovely people. Everyone knew everyone else. There was always someone who would help out others in their times of trouble.” May recalls having to do the family’s shopping before going to school and also getting her first job: “I was 13 and the government allowed you to do a little job. May and her late husband George lived for 37 years in Old Woking, where they brought up their three children. She recalls moving from Old Woking to a Goldsworth Park bungalow with George in 1976, during the estate’s early construction phase. There were no shops or facilities, but she joined the parish church, St Andrew’s, which was in its infancy: it had no building and for many years held its public services in Beaufort School. “The period of planning and fundraising that led to St Andrew’s Church constructing its own building was an exciting time,” she said. May still attends the church when she can. She is visited regularly by many friends from St Andrew’s and the whole church signed congratulatory birthday cards for her 100th birthday. George died in 1996 but May has stayed in the same bungalow in Greythorne Road where she is cared for ‘wonderful people’ and ‘my wonderful family’. a lot of ill-health. I was very ill and diagnosed with heart trouble when aged 15 and spent a period in St Thomas’ Hospital in London.